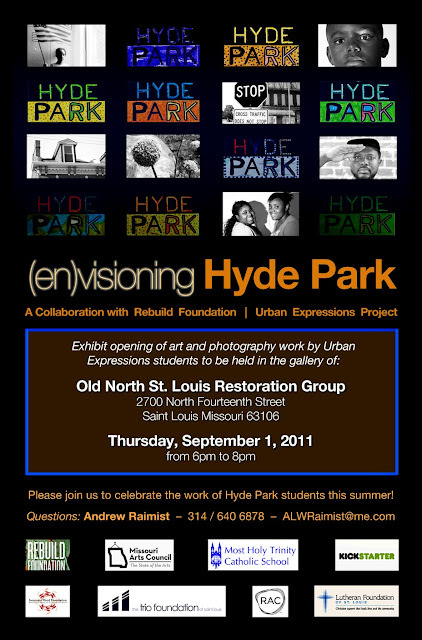 Please read and share this notice regarding the upcoming exhibition opening for (en)visioning Hyde Park. The opening will take place on Thursday, September 1st from 6pm to 8pm. This very special opening features the work of middle school children living in Hyde Park who participated in Rebuild Foundation's Urban Expressions program in June and July. Andrew Raimist acted as digital photography instructor and the results of their summer's work will be on display. The kids will all be given awards and certificates as well as a book documenting their work along with the accomplishments of Washington University students in the CityStudioSTL design-build studio. If you're unable to join us, please share this information on your blog or with your social media contacts. This project has been generously supported by backers of our Kickstarter grant as well as support from the Missouri Arts Council, Rebuild Foundation and Most Holy Trinity Catholic School. We welcome additional contributions to this worthwhile community arts effort. Take a look at this short video introduction to the IgCC (International green Construction Code) announcing our local chapter's USGBC meeting next week on Tuesday, August 9th. Video by Andrew Raimist, 2011. SPEAKER: Dave Bowman, PE, Manager of Codes for the International Code Council ’s Codes and Standards Group. Mr. Bower’s responsibilities include the management of all ICC standards development and the direction and coordination of ICC Staff when assisting or participating in standards development with other organizations. He also maintains the integrity of the referenced standards chapters of the I-Codes and assists code development as the Staff Secretary for the IBC Fire Safety Committee and the IBC General Committee. He provides portions of the IBC Commentary and is involved in the development of the ICC Performance Code. Free for USGBC-Missouri Gateway Chapter Members, ASHRAE – St. Louis Members, MABOI Members, and Full-time Students; $20 for Non-members. Click here to visit our Event Registration page. Scroll down and click the “Register” button under the International Green Construction Code event listing. Contact USGBC-Missouri Gateway staff at usgbc-mogateway@mobot.org or (314) 577-0225.